Flew me to a past not far away. Final Fantasy XIV's Little Ladies Day will take place from March 1, 2018, until March 14, 2018. Idol group Songbirds will be returning to perform, and you'll be able to participate with a range of new glowstick-y emotes for the celebration (Cheer Jump, Cheer Wave, and Cheer On), as well as collect the exclusive items Far Eastern Doll Display, and the Siren Song Orchestrion Roll. "Come one, come all, for a celebration made vibrant with colour and singsong!" states the invitation on the official Final Fantasy XVI website. "The Songbirds have returned once more to grace the stages of Ul'dah. This year's performance is said to be unlike any other, and a reporter from the Mythril Eye is inquiring after those who would partake in the revelry." To participate, you'll need to be at least level 15—just head to Mythril Eye Reporter for more information. Make sure you complete any seasonal quests before the event ends to secure your goodies. 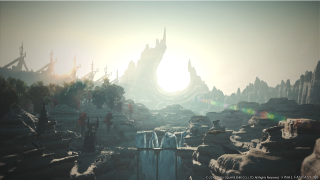 Final Fantasy XIV is available now on PC and PlayStation 4.